y mother’s scrapbooks call to me occasionally and, sure enough, they beckoned me again yesterday. In one of them I found a series of telegrams that my mother had written to her mother in 1944. They tell an exciting story of love during World War II. Jane was my mother, and she was on the move. You can feel her excitement and her frustration about the delayed train in her brief words. You can also see that she cares about her mother and doesn't want her to worry. 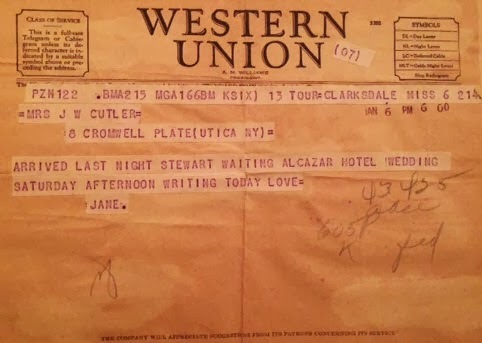 This telegram gives me the address of my grandmother in January of 1944, good information. 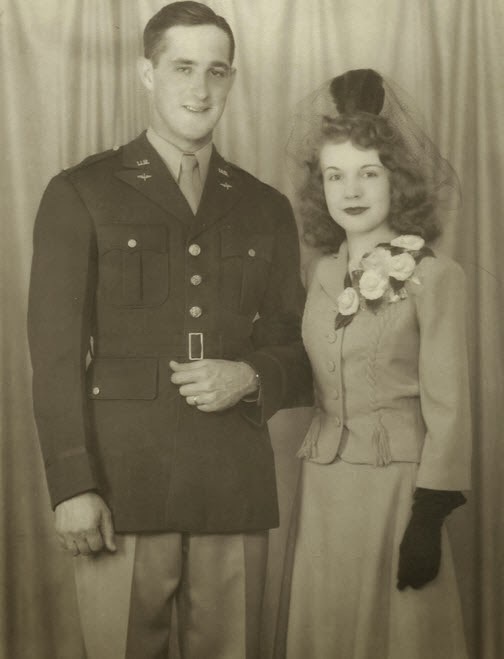 Stewart was my father and, like many men, he was in the service during World War II. Due to wartime and the nature of the military, he was moved around the world at a moment’s notice. In order for my mother to see him, haste was necessary. I am sure that my grandmother was sad that she was not present at the wedding of her only child. 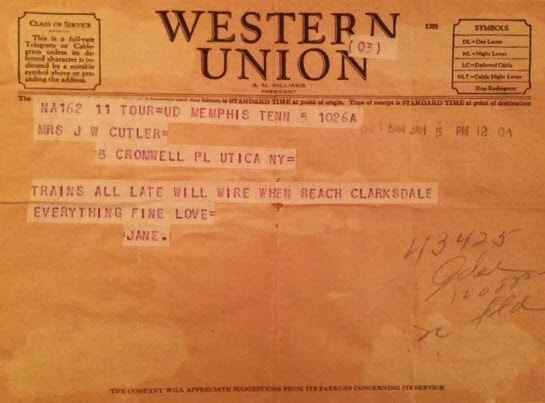 So, according to this telegram, my parents were married at 3:00 on January 8, 1944, in an Episcopal Church in Clarksdale, Mississippi.” This telegram is direct evidence of my parent’s marriage—it is explicitly stated. 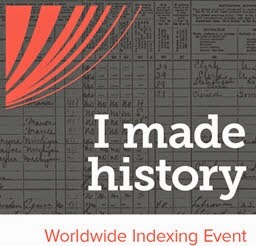 I confirmed that January 8, 1944 was a Saturday by checking the website www.timeanddate.com. 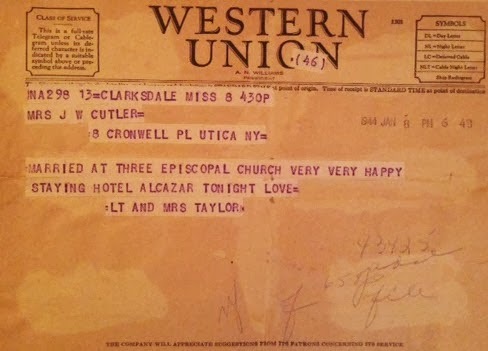 Notice the way my mother signed the telegram: Lt. and Mrs. Taylor. It was obvious that she liked being married to an officer. I decided to check my parent’s Marriage License to compare the information from the telegram. 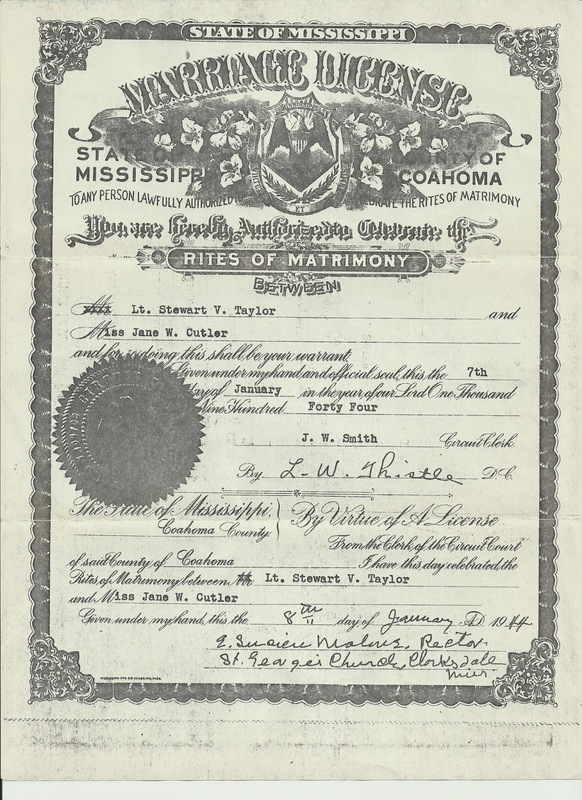 While the Marriage License has details about the marriage, the telegrams have the time of the ceremony (3 p.m.) as well as an account of the events prior to the wedding. In addition, the telegrams tell me that my parents were staying at the Alcazar Hotel. The more evidence we can find about our family, the more we can build a correct and real picture of their lives. How brave your mother was to decide on marriage, in the face of the possiblity that her husband could be "moved around the world at a moment's notice" in the face of the war raging at that time. Enjoyed the way you juxtaposed scans of the actual telegrams with the story. And yes, I could tell right away that your mother relished using that rank in her signature! Thanks, Jacqi, for your comments. It was a different world in the 1940s. I am thankful that my mother and grandmother were keepers of information.